The Nationals were founded in 1946 and joined the already established National Basketball League. Despite being in one of the larger markets in the NBL the Nationals found it difficult to win games as the rival BAA began luring players away from the NBL all together. Even though they struggled the Nationals managed to make the playoffs in all three years in the NBL. The Nationals were one of many teams to join the NBA when the NBL and BAA merged in 1949. Behind Dolph Schayes the team finally started seeing success and made the first NBA finals where they would lose to the Philadelphia Warriors. They would make the finals again in 1954 and again in 1955 where they would capture the franchises first NBA title. Syracuse proved to be too small and the team was looking to move, even though they were year in and year out one of the best teams in the NBA. Eventually they found their opening when the Warriors left Philadelphia for San Francisco, the Nationals swooped in and became the Sixers. 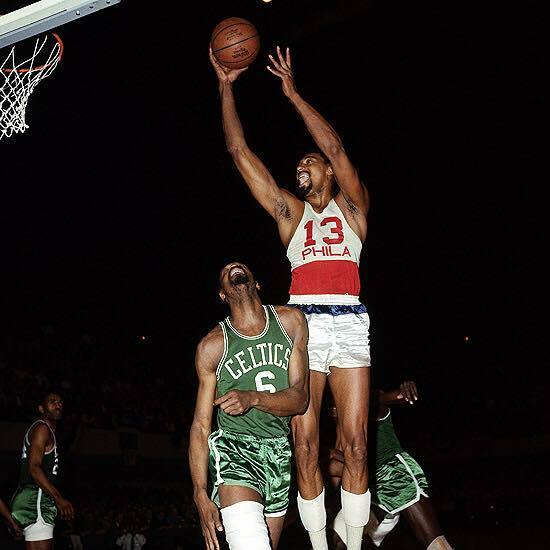 The 1967 NBA playoffs looked to be just like any other NBA playoffs of the 1960s, with the Boston Celtics claiming the NBA title. The Celtics had won 8 NBA titles in a row and nothing looked to be able to stop them. 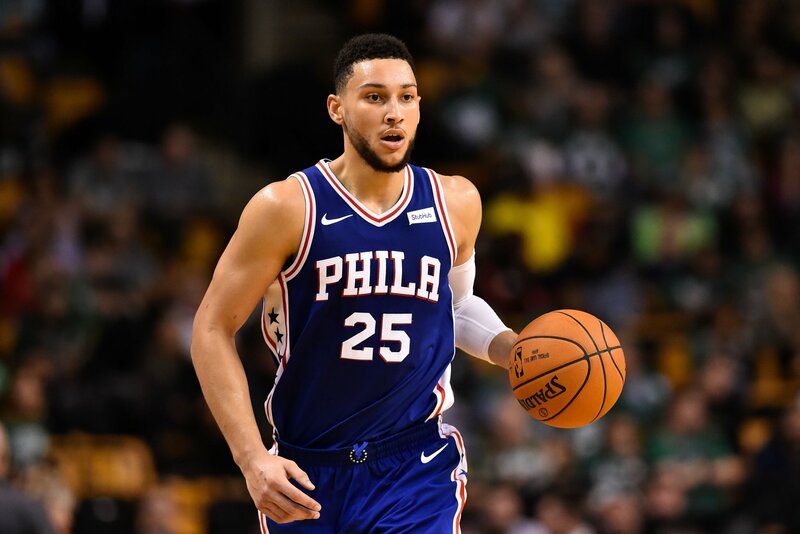 The Sixers had been knocked out of the playoffs by the Celtics each of the previous two seasons, and the Warriors, who had been in Philadelphia before the Sixers, had suffered at the hands of the Celtics as well. But nobody has suffered at the hands of Celtics like Wilt Chamberlain. His playoff hopes and ambitions were constantly being crushed by the green machine. Chamberlain would have an unofficial quadruple double in game 1, and in game 3 he pulled down 41 rebounds. The Sixers would grab a 3-0 series lead. No team in NBA history had ever comeback from a 0-3 deficit, but if anyone could it would have been the Bill Russell lead Celtics. Boston grabbed game 4 to avoid the sweep, but Chamberlain and Sixers proved to be too much as the Sixers handed Boston their first series loss since 1958 and ended an 18 series win streak, the longest in NBA history. The Sixers would go on the face the Warriors in the NBA finals. The Sixers would take vengeance on another old nemesis, beating the former Philadelphia team in six games to win the NBA title. Sadly, for Sixers fans Boston would regain its composure and beat the Sixers the next two years in the playoffs enroute to two more of their 11 NBA titles in 13 years. In one of the greatest oddities in NBA history, four players played for both teams during the same NBA game. This happened because there was a protest of a game played between the Nets and 76ers on November 8, 1978 and the replay of the game was done March 23, 1979 and in the meantime the Nets and 76ers had made a trade that sent Harvey Catchings and Ralph Simpson from Philadelphia to New Jersey and Eric Money and Al Skinner from the Nets to the 76ers. This is the only time in NBA history where players started a game with one team and finished it with another. There have been several instances where games were replayed and players played who were not on the teams originally due to injures, suspensions and trades. The Curse of Billy Penn was used to explain the failures of the four major Philadelphia Sports franchises. The curse came about in 1987 when One Liberty Place was built. For years there was a gentleman's agreement that no building would be taller than Philadelphia City Hall, but One Liberty Place stood almost 400 feet higher than City Hall. Atop City Hall there is a statue of William Penn, the founder of the Pennsylvania colony. The building of One Liberty Place apparently angered either the statue or the ghost of William Penn and the Philly sports franchises began to lose. Before the curse, the teams in Philadelphia had seen a lot of success. The Sixers had won multiple NBA titles, the Phillies world series, the Flyers the Stanley Cup. Only the NFL's Eagles had not won a championship in Philadelphia. The late 70s and mid 80s also brought a lot of success to the city. The Flyers won back-to-back Stanley Cups in 74 and 75, the Phillies won the 1980 world series, the Sixers went to four NBA finals winning the 1983 NBA finals, the NCAA's Villanova Wildcats won the 1985 NCAA tournament and even the Eagles made the Superbowl in 1980. After the completion of One Liberty Place the city seen all its sports teams struggle. The Flyers would make two Stanley Cups and lose them both, the Eagles would make the Superbowl again and lose, the Phillies would only make the playoffs one time from 1987-2007 and lose the World Series. The Sixers would make the finals in 2001, but mostly struggled through the 1990s. The curse was broken when a small William Penn figure was affixed on the Comcast center. In 2008 when the Phillies won the World Series. The Villanova Wildcats would also go on to win two NCAA titles in 2016 and 2018 and the Eagles would finally win a Superbowl in 2018. The name Harvey Pollack may not mean a lot to most NBA fans, but the man is one of the most important people in not only NBA history but basketball history. He started working for the BAA's Philadelphia Warriors in 1946m the year the team and league was founded. He was mostly in charge of keep track of fouls, points and other statistics. Over the years he would create these statistics into a yearbook. Without his stat keeping we would have lost a lot of stats from the early era of basketball. Pollack was the score keeper on March 2, 1962 when Wilt Chamberlain scored his 100 points. He also gave Chamberlain the card with 100 written on it, in Pollack's hand writing. The photo of Chamberlain holding up the card is one of the most iconic pictures in NBA history. Pollack claimed that Wilt Chamberlain recorded multiple quintuple-doubles, where a player has double figures in all-five statistical categories. Unfortunately, these cannot be verified as the NBA did not keep track of blocks or steals until 1972. When the Warriors moved to San Francisco and the Nationals moved from Syracuse to Philadelphia, Pollack stayed in Philadelphia and joined the Nationals. He would stay with the 76ers until his death in 2015. When Pollack died in 2015 he was the last remaining person associated with the NBA to still be working for the NBA. Because of his work, he is often regarded as the father of statistics. The early days of basketball often seen slow fan-unfriendly low scoring matches that often left spectators bored. Games often only got into the 40s and many of the best players averaged less than 15 points a game. Many early basketball games looked more like a glorified version of the childrens game of keep-away than an action packed professional sport. 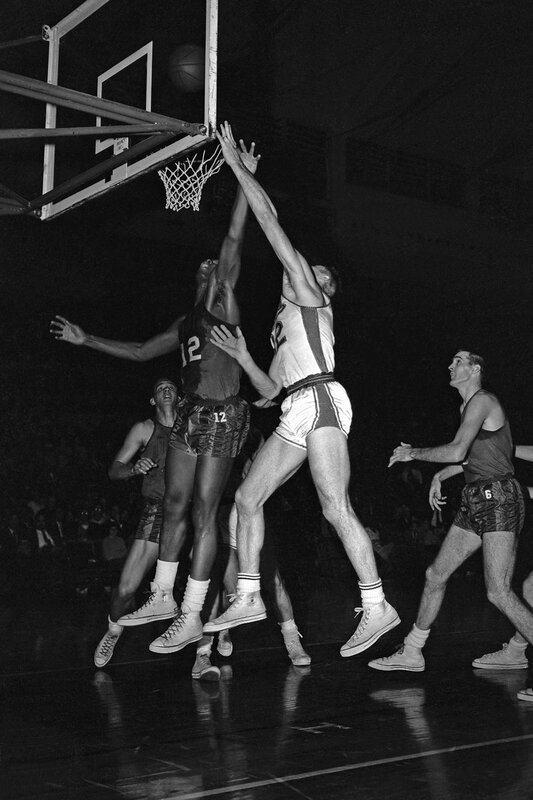 This style of play culminated in a game between Minneapolis and Fort Wayne, where the Pistons of Fort Wayne held the ball most of the second half nursing a 1 point lead over the Lakers. The Pistons would win 19-18 in the lowest scoring game in NBA history. Prior to that the fewest points ever score 33 points, just 4 fewer than both teams scored, and that game was one the opening night of the NBA, or BAA as it was called back then. This place pace bored fans, many of whom where promised an action packed fun experience and attendance and interest in the new league had begun to dip. The NBA needed a solution and needed it fast. The solution was an ingenious one and one that would revolutionize the game as we know it. A simple clock, with just 24 seconds on it would forever change the game. The clock was the brain child of Syracuse Nationals general manager Leo Ferris, a man that the NBA has long forgotten in one of the biggest travesties in the games history. Ferris, is as important to the early days of the NBA as anyone and one could argue that without Ferris there would be no NBA today; and there definitely would be no Atlanta Hawks, or Philadelphia 76ers. The NBA would look much different today without Ferris's input all those years ago. Schayes was a star big man in his basketball career for the Syracuse Nationals, the precursor to the Philadelphia 76ers. Thought, unlike, other bigs of his era, Schayes possessed the ball handling skills of a guard. His ball handling and passing ability made him nearly unstoppable and ranks him second in the early NBA era of big men behind only George Mikan. He was drafted by the Knicks of the BAA and by the Waterloo Hawks of the NBL, but the Hawks sold his rights to the Syracuse Nationals. The Nationals offered Schayes more money than the Knicks, so high signed there instead of joining the bigger market Knicks. 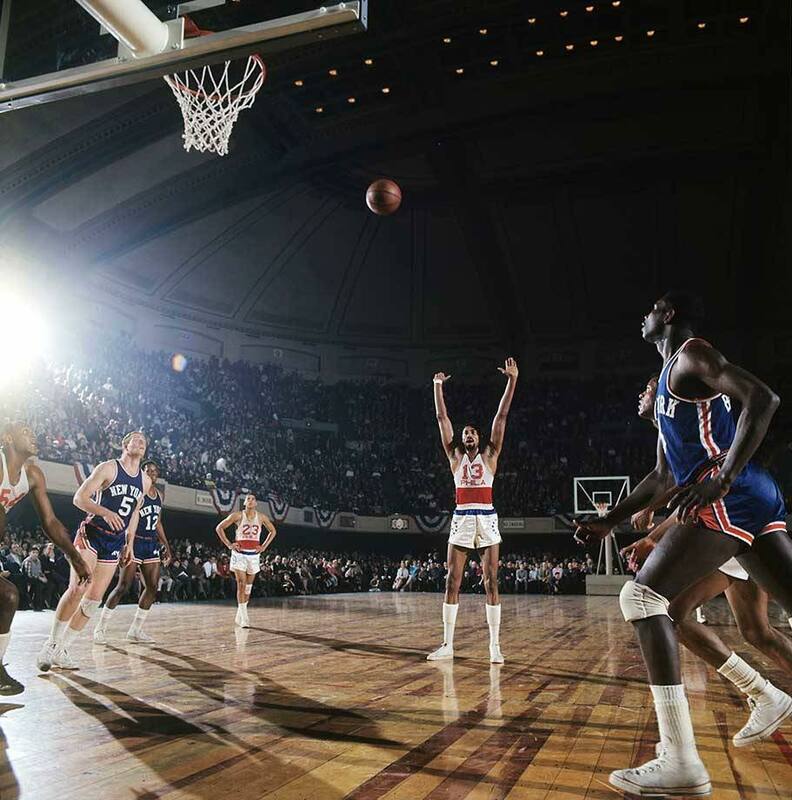 Wilt Chamberlain shoots a free throw. Bill Russell Fouls Wilt Chamberlain. Joe Holup goes for a layup against Maurice Stokes. 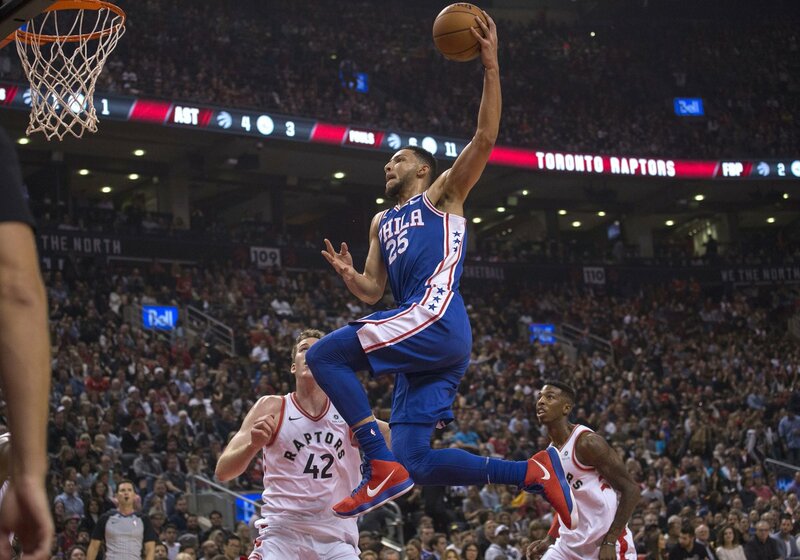 Ben Simmons flying in for a dunk. The Sixers hope the Ben Simmons can be their saving grace.